The first commercially available graphene-infused paints in the UK are now on sale from The Graphene Company, the exclusive distributor of the Graphenstone range of paints and materials. Sourced from pure carbon, Graphene is the strongest material now known to science. It was discovered in 2004 by two Nobel Prize winners at Manchester University. It is a highly inert, innocuous, nontoxic pure carbon. Graphene’s inclusion in paints, coatings and other building materials exponentially enhances hardness, durability, compression, tensile strength, elasticity and coverage. It reduces the weight of materials and delivers significant savings in materials consumption, maintenance, manpower and costs. Graphenstone produces over 1000 colours of highly sustainable and ecologically-friendly coatings available for both indoor and outdoor new build or restoration projects. Its materials are already proven to deliver visible, tangible and long lasting value with an international track record of use in large and small construction, redecoration and restoration projects. Graphenstone has already achieved industry accolades and numerous certifications. The Graphene Company founded by hedge fund and smoothie entrepreneur, Patrick Folkes, is bringing Graphenstone to the UK for the first time. Although applicable to any substrate, the UK market focus for Graphenstone paints is initially on three areas: projects with smart, sustainable and eco-build goals; optimum hygiene environments – such as in healthcare, education and catering; and buildings in corrosive or challenging climates. Graphene fibres form a transparent nanolevel mesh which is fully encapsulated within the Graphenstone paint. The fibres are: highly inert, so corrosion resistant; 200 times stronger than structural steel; 1000 times more conductive than copper; and provide greater flexibility without damage compared to common coatings. The graphene mesh delivers supreme durability by functioning as an extremely strong, consistent and flexible frame that supports the natural mineral elements of the Graphenstone paint. The graphene also eases application of the paint which delivers two 8m2 coats of paint per litre on average. Hence it reduces maintenance and labour as well as speeding time-to-completion of projects. As graphene is a conductive material, the paint improves the thermal regulation of buildings, saving energy by requiring less heating and air conditioning. Graphenstone paints are derived from raw natural mineral limestone (calcium carbonate (CaCO3)) processed through a traditional artisanal and carbon neutral lime cycle process. First quicklime (calcium oxide (CaO)) is extracted from the limestone through a calcination process. Pure natural water (H2O) is then used to hydrate the quicklime, converting it into calcium hydroxide (Ca(OH)2), an extremely pure and active lime with over 98 per cent whiteness. Once applied to a substrate, the calcium hydroxide in the Graphenstone paint absorbs CO2 as it cures so it returns to calcium carbonate with the same inert properties of raw natural mineral limestone, thus closing the lime cycle. The porous nature of Graphenstone’s lime and graphene-infused coatings ensures that walls can still breathe. This improves air quality, reduces room humidity, acts against moisture collection and condensation, and contributes to safe and healthy environments. Microorganisms and microbial growth of bacteria and fungi are deterred from rooms where Graphenstone paints are applied due to the high alkaline pH of the lime and the paints’ ventilating properties. Indoor odours, as well as biological and chemical pollutants are diffused, and allergens are reduced. The low odour and non-harmful characteristics of Graphenstone paint mean that rooms can be occupied within a few hours of application. The materials have been engineered so they are free from volatile organic compounds (VOC), formaldehyde, heavy metals, toxic substances, carcinogens and harmful agents such as biocides or plasticizers. This makes Graphenstone ideal for people who may suffer from intolerance to chemicals in paint. Graphenstone paint is certified by the independent German laboratory eco-INSTITUT as being free from substances that degrade the environment. It is also carbon neutral –as the paint cures and over its lifetime each square metre of Graphenstone paint absorbs 120 grams of CO2 from the local environment where it’s applied. 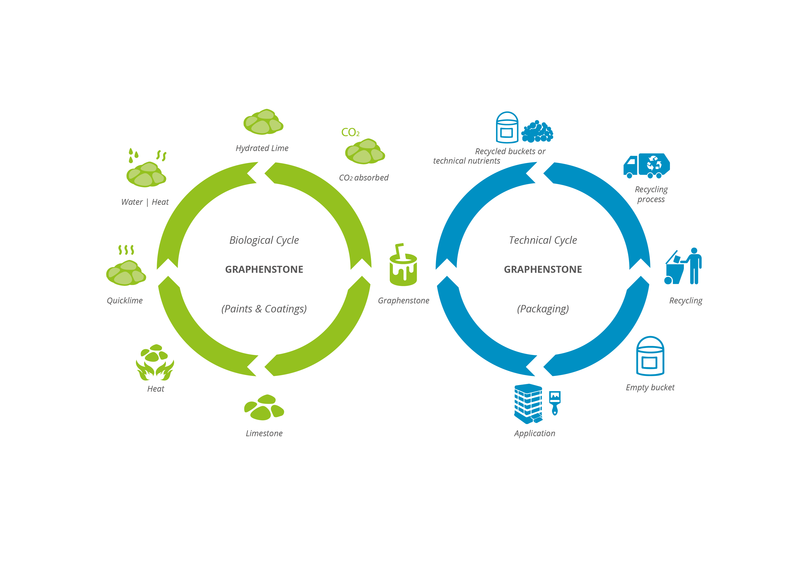 In addition to its various environmental certifications, to date Graphenstone is the only paint in the world to meet the Cradle to Cradle Gold Standard which provides consumers, regulators, employees, and industry peers with a clear, visible, and tangible validation of the manufacturers’ ongoing commitment to sustainability. Products are made from natural elements rather than chemicals and packaging is derived from recycled materials. In 2015 Graphenstone won the “Innovation and sustainability” award at the Beyond Building Barcelona - Construmat Fair from Fira de Barcelona. The Graphene Company is currently researching, negotiating and developing other exciting new products for future commercialisation in the field of graphene in a wide range of markets. Our objective is to create a stable of exclusive ‘disruptive’ products in the UK markets and overseas. For further editorial information, images and interviews please contact graphenstone@pwkpr.com or call 07904414889.